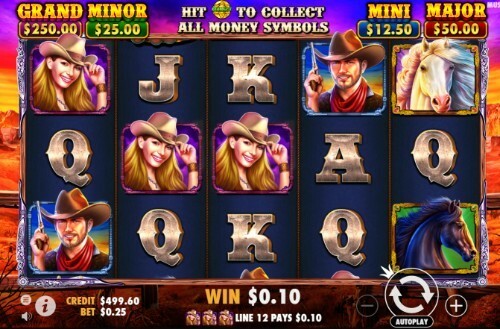 Pragmatic Play is the developer behind this 5x3 online slot, which is set in the world of cowboys and the American deep south, and belongs to the ‘Old West' genre which has been popular in online slots for years. There are 25 fixed winning lines to find, two bonus features to trigger, and RTP at 96.53%. We're thrilled to bring it to UK Slot Games players, along with our whole library of more than 500 online slots including Great Rhino, Starburst, Rainbow Riches and Bonanza. Pragmatic Play is a prolific producer of online slots, never failing to release one (and sometimes two) every month. That means 2019 has already been a busy year for them, but they kicked it off by releasing Mustang Gold. If the name sounds familiar, it might be because you're thinking of Pragmatic Play's Wolf Gold slot, which won awards when it was released in 2018. There's no formal connection between the two slots that Pragmatic Play acknowledges, although they clearly have similar names, and also have similar themes. They address the themes from differing perspectives though; Wolf Gold had a Native American feel to it. Mustang Gold is all about the cowboys, so saddle up, ride into town and try to grab some winnings before high noon! Mustang Gold isn't a complicated slot to play. Nor is it a complicated slot to look at. The graphics are solid-but-unspectacular; well drawn but lacking in cutting-edge 3D effects or animations. The background is plain blue, the reels are wooden, and the characters on the reels look friendly. That's about as much as you can say for the design. A 5x3 layout and 25 pay lines are nothing to write home about, either. Despite all of those apparent shortcomings, Mustang Gold manages to be more than the sum of its parts. The bonus features go a long way to help with that fact, and we'll be talking about them later on. The soundtrack helps a lot with the slot’s atmosphere - it’s precisely the sort of thing that you’ll have heard in the background of an old Western movie being screened on a Bank Holiday Sunday afternoon. If the graphics leave you feeling a little flat, the sounds will lift you back up again. From our description so far you'll likely expect the symbols to be a straightforward affair, but they're not. It will surprise nobody to discover that playing cards J through to A account for those of the least worth. A pair of horses (one black, one white), a cowboy and a cowgirl round out the basic symbols and are worth more than the playing cards. Then we move on to the slot's special symbols, and that's when things become a little more interesting. For a start, there’s a wild symbol. It’s represented by the slot’s logo, and can only appear on reels two, three, four or five. It will substitute for any of the symbols we’ve told you about so far to create a paying line, but not for any of the extra symbols we’re about to tell you about. There’s a campfire symbol in this slot, and it’s used as a scatter. Like the wild, it only appears on selected rows; this time it’s just two, three and four. The scatter triggers one of the bonus features. As well as the above, there are a pair of symbols which are designed to work together. Golden horseshoes may appear on reels one to four and will have a cash value printed on them. They're worth nothing, though, unless they're also paired with a sheriff's badge ‘Collect' symbol. We can't explain how this works without talking about the bonus features in general, so we'll move on to those! There are three bonus features in Mustang Gold, one of which is a progressive jackpot and could see you win big if your luck is in. First up is Free Spins. As we hinted at above, you'll need three scatter symbols to win this round, which begins with eight free spins and can be triggered again using the same method that started it. Unlike some free spins features you may have played elsewhere, there isn't a multiplying factor applied to winnings found during your free spins. Also unlike free spins features you may have played elsewhere, this feature works in tandem with one of the slot's other bonus features! That bonus feature is the Money Collect, and it's where your horseshoes and sheriff badges will come in handy. Money Collect is active during the base game, but you'll be more likely to profit from it during free spins because there are extra horseshoes and sheriff's badges added to the reels. Whenever the sheriff's badge/collect symbol appears on the fifth reel, you'll be awarded the combined cash value of any horseshoes that are also in view. That's annoying if it happens when there's nothing to be won, but if you have two or three horseshoes on the reels at the same time it can become quite generous! Sometimes, the horseshoes won't have cash values printed on them. They'll have ‘jackpot' printed on them instead, and if you manage to ‘collect' while you have a jackpot horseshoe on the reels, you enter into the slot's Progressive Jackpot. All you need to do here is keep choosing horseshoes from the grid provided until you have a matching pair. When you have a pair that match, you win whatever prize is printed on them. That can be as much as £2,500! We've seen progressive jackpots linked to slots in many different ways, and we think connecting one to a bonus feature in the way Pragmatic Play have done with Mustang Gold is quite novel. This slot perhaps suffers a little by looking more simple and basic than it is; once you have a bonus feature in play, it quickly becomes quite sophisticated and profitable. Once you've played a couple of Pragmatic Play slots, you learn how to identify them by sight. They have a very strong visual identity, which is used in every slot they design. The studio is Maltese, and has been creating online slots since 2007. In the last couple of years, it feels like they've hit their prime. The success of Wolf Gold last year is the best example of that; the slot picked up ‘Game of the Year' awards from more than one ceremony. That's probably what gave them the idea of creating something quite similar in Mustang Gold. The Old West-themed slots aren't the only thing they're known for though - the animal-themed Great Rhino and the mining-themed Gold Rush have also won them plaudits. Pragmatic Play's entire slot catalog stands at well over one hundred, and is added to seemingly every month. If you like the way Pragmatic Play design their slots, the good news is that there's always a new one just around the corner!